Meet the staff at CAARS - Fueled by our passion for auto repair. At CAARS, having ASE Certified Technicians is our way of ensuring that qualified and knowledgeable expert technicians are working on your automobile. You wouldn't see a doctor who’s not an M.D., so we believe the same discretion applies to the person who repairs your car. ASE is the National Institute for Automotive Service Excellence. An ASE certified technician has undergone extensive testing and certification in vehicle service and repair. Before any technician can qualify to be ASE certified, they are required to have two years of automotive experience, or one year of experience and a two-year degree in automotive repair. ASE offers more than 40 different exams designed to accurately measure the competency and knowledge of the technician seeking certification. Certification is not for life. To remain certified, ASE specialists must retest every five years to keep up with advancing automotive technology. The next time you see the ASE patch on one of our tech’s uniform, you’ll know you have a qualified person at the helm. A part of the San Juan Capistrano community for more than 20 years, Vince moved to South Orange County in his teenage years and is raising his two daughters here. 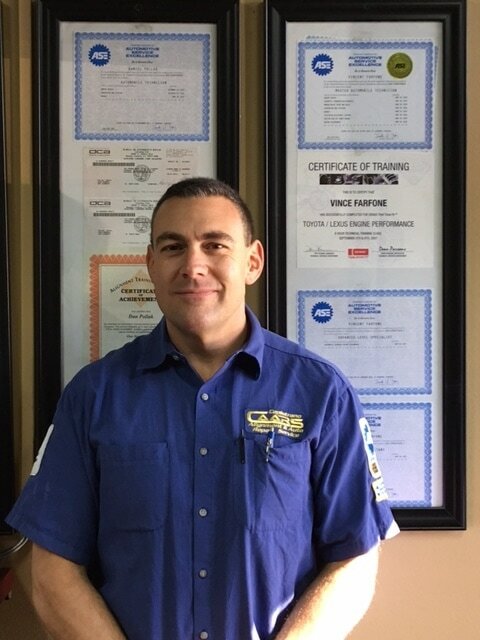 An ASE Certified Master Automotive Technician and Advanced Engine Performance Specialist & Service consultant, Vince has over 30 years of automotive repair experience. A large part of his experience was spent in dealerships, including 8 years with Acura as a Master Technician and 7 years with Saturn where he worked his way to Service Manager. Vince continues to attend training seminars around the country to keep up with the evolving automotive industry.